The half-way point of any endeavor marks a critical time to reflect on what has been accomplished and what lies ahead. Looking back on the first half of my year in an integrative medicine residency as the STAIR resident reveals a surprising shift in my confidence, a fine array of skills, plus a pivotal realization about acquiring these two assets. Recall Eugene Rosenberg’s iconic statement, “As our circle of knowledge expands, so does the circumference of darkness surrounding it.” Apply that to ten years of college, two sets of board exams, six months of residency, and you get a very large circle of awareness about just how much I don’t know yet. Humbling, to say the least. Enough patients? My days at Revolution Health Medical Center are full of hands-on treatments and hour-long visits, while the conventional doctor’s office serves 20 patients by lunchtime. That's plenty. Variety? The changing seasons ensure that I see a blend of acute colds and flus along with chronic and complex pathologies. 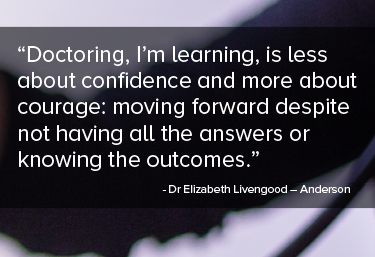 Doctoring, I'm learning, is less about confidence and more about courage: moving forward despite not having all the answers or knowing the outcomes. It’s the same in life: every day, we face our fears and take another step forward, finding joy in the present, knowing that much has been accomplished and much remains to be done.